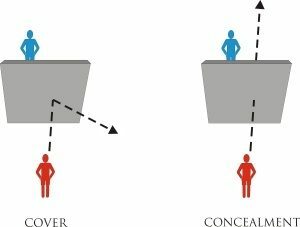 Time for another post to help expand your training and knowledge, this post is about Cover vs Concealment. Pretty straight forward and easy to understand but too many people I have seen or even trained with make common mistakes when talking about cover or concealment. So lets start with Concealment. Concealment by it’s name alone explains it, you are hiding or concealing yourself from someone or something. Common methods utilize camouflage, shadow play, night movements etc. A key here is that you are not protected by anything (usually) when you are speaking about concealment. Now cover is something completely different but it can also conceal you. Cover is the use of solid objects between you and your enemy, preventing projectiles or another type of weapon to penetrate you easily. Not all cover is good, like hiding behind soft furniture will not stop a bullet, nor will most single sheet rocked walls. A nice brick or concrete wall or multiple inches of solid wood can help to cover you. So I think you are getting the difference here. Now there are methods to enhance your concealed location to enhance your protection. Some examples are layers of ballistic cloths within a couch or chair, the same can also be added to your automobile panels. Other ideas are a bit more work like hardening your walls with layers of steel plating or sand bags in a wall. A modern ninjutsu practitioner must be aware of the use and protection from firearms and cover and concealment are two tactics that you need to understand well and make use of in your life plans. Hello Ninja Fans, well it has been a while since I threw the gauntlet down in front of you. The last time only a few actually picked it up and took the challenge seriously. Do you remember last years 52 week financial challenge, I only receiver 17 confirmations, from those who actually completed it. Sad in today’s world but the money was not the point….it is the discipline, the sacrifice, the challenge that was why the challenge was thrown out at you. So now what? Well how about the Ninja 90 challenge! You notice it says 90, but not much else right? Well yesterday I decided to challenge myself for the next 90 days to accomplish as much as possible, physically, mentally, emotionally. This will not be easy I can guarantee that but if you accept the challenge you can make large strides in a very short amount of time. Step 2: Physical challenges teach discipline, so commit to working out a minimum of 3 times per week with the 90 circuit: 30 Push ups, 30 Sit ups, 30 Burpees (no break between sets, rest between circuits) Week 1 = 1 complete circuit, Week 2 = 2 Complete circuits, Week 3 = 3 Complete circuits, Week 4 = 4 Complete circuits. Step 3: Stay connected on the Ninjutsu Training Online website and Facebook page, post your comments, and stay tuned for additional tid bits being thrown out to you. Hey, it all sounds easy right…..well it isn’t and today was tough for me to get started. It was kind of funny I was having a cup of coffee and I happened to hit a motivational video and it shook me. I was starting to come up with excuses on why I should hit the run this morning. The roads are snowy, it’s cold, I feel off blah blah blah. So, I stopped right there and took a look around my family was still sleeping, so I started to stretch out and practice a few mobility drills, put my gear on hit the road and nailed an 8.72 mile! Day 1 of my 90 day challenge has begun and I am kicking it up a notch, I hope you will join me on this journey. 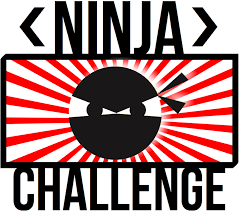 This entry was posted in Uncategorized and tagged Ninja Challenge on April 2, 2017 by admin.